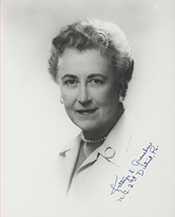 GRANAHAN, Kathryn Elizabeth, (wife of William Thomas Granahan), a Representative from Pennsylvania; born Kathryn Elizabeth OHay in Easton, Northampton County, Pa., December 7, 1894; educated in Easton public schools; graduate of Easton High School and Mount St. Joseph Collegiate Institute (later Chestnut Hill College), Philadelphia, Pa.; supervisor of public assistance in the State Auditor Generals Department, and liaison officer between that department and Department of Public Assistance, Commonwealth of Pennsylvania, 1940-1943; member of national board, Womans Medical College of Pennsylvania; delegate to the Democratic National Convention in 1960; elected as a Democrat to the Eighty-fourth Congress, November 6, 1956, by special election to fill the vacancy caused by the death of her husband, William T. Granahan, and at the same time was elected to the Eighty-fifth Congress; reelected to the two succeeding Congresses and served from November 6, 1956, to January 3, 1963; was not a candidate for reelection in 1962 to the Eighty-eighth Congress; appointed Treasurer of the United States and served from January 9, 1963, to November 20, 1966; retired; died in Norristown, Pa., July 10, 1979; interment in Gethsemane Cemetery, Easton, Pa.
Kathryn E. Granahan in Women in Congress, 1917-2006. Prepared under the direction of the Committee on House Administration by the Office of History & Preservation, U. S. House of Representatives. Washington: Government Printing Office, 2006.